When it comes to mysterious locations around the world, there is one location that draws quite a lot of attention, particularly by those who believe in extraterrestrial life forms. Area 51 is located 83 miles north-northwest of Las Vegas, Nevada and each year crowds of people flock to the area to see what they can see in the sparse Nevada desert. While the actual area of Area 51 lies in a restricted location, visitors to the area often find themselves dropping in to the local diner and gathering spot for lovers of all things extraterrestrial – the Little A’Le’Inn. Inside the Inn alien lovers gather to share their encounters of a close kind and tell of just how close they got to Area 51 before they were caught by the patrolling security guards that monitor the perimeter to ensure that there is no breach of security. Why is security such a big deal in Area 51? The answer to that depends upon who you ask. Area 51 is a military base located in southern Nevada at 37°14′06″N, 115°48′40″W. Owned by the United States government and operated by the United States air force this military base located at the elevation of 4,462 feet is a detachment of Edwards Air Force Base located in California in the Antelope Valley. The center of Area 51 features a large airfield and the intended purpose for the base is to test and develop experimental weapons and aircraft for use by the United States military. The location of Area 51 puts it inside the Nevada Test and Training Range and it is referred to by military personnel as the Air Force Flight Test Center – Detachment 3. It is important to note at this point that Area 51 shares its border with a portion of the Nevada Test Site which offers it additional protection from those who would spy upon any activity within the military base. The Nevada Test Site is now referred to as the Nevada National Security Site and is a 1,360 square mile section of Nevada that is reserved by the United States Department of Energy for testing. The NTS was developed in 1951 and was done so for the testing of nuclear weapons. In total 928 nuclear tests have been performed by the United States Department of Energy and of those 739 were conducted at the NTS. Why is Area 51 Such a Big Deal? The biggest factor that makes Area 51 such a subject of intrigue for many is the secrecy that surrounds the base. Anyone with military experience – or not for that matter – can understand why military weapons and aircraft testing and development need to be kept a secret by the United States government; however, many people construe this secrecy to mean that there is something strange and extraterrestrial going on at the base. It is certainly understandable why such developments need to be kept under lock and key; however, what sparks much intrigue for many is the fact that the government tends not to acknowledge the base and refuse to address its existence. Again this could be understandable to some, but for others it just adds more fuel to the fire that there is something unearthly going on at the base. Why Are So Many Conspiracy Theories? For those who believe that there is something peculiar happening over at Area 51, rumors of extraterrestrial activity abound. The government enforces these rumors by refusing to address any matters concerning the military base; however, as a matter of national security one could expect no different from them. It isn’t so much the denials of government officials or the avoidance of addressing the area directly or even the armed guards who patrol the perimeter of the military base, but it is the mysterious lights that often appear in the sky over Area 51 that attract the most conspiracy theorists. For those who do not buy in to conspiracy theories there is little question that these strange lights are related to the fact that Area 51 is a testing ground for weapons technology as well as aircraft development. As new technologies are created they are bound to differ from anything we have ever seen before and as these things are tested they are going to attract attention from anyone within viewing distance. Lights cast in the sky could easily be the result of a new stealth aircraft – ask the conspiracy theorists though and they will tell you that those lights are no aircraft of human creation, that they are instead, extraterrestrial beings. What Exactly Has Area 51 Been Used For? While the questions about alien activity remain, Area 51 has had many uses in military history aside from the development of new aircraft and weapons systems. During the time of World War II the Groom Lake area was utilized for both artillery and bombing practice and it was this that set the base up for the U-2 project. After being used for practice during the time of WWII the area was abandoned until 1955 and it was in 1955 that Lockheed decided to use the area as a test facility for the U-2 spy plane. The area was selected by Lockheed because it was not only secluded but the lake bed also offered the perfect airstrip on which to test the aircraft as they perfected it. The river bed was not the only geographic feature that made the Groom Lake location perfect for U-2 development, however, the mountains of the Emigrant Valley as well as the Nevada Test Site perimeter that had been set up provided for plenty of protection of any activity and testing that took place in the area. Lockheed began to build out the area to suit their testing needs and by 1955 they had set up a base that consisted of a 5,000 foot runway and a number of shelters, homes and workshops to house the workers assigned to the area. The base built by Lockheed was particularly sparse but it served its purpose and the same month that the base saw the completion of its runway it saw delivery of its first U-2. One month after the delivery of its first U-2, the makeshift base saw its first U-2 take flight. While U-2 plane fleets were dispatched to Soviet territory just a year later, U-2 development continued but was frequently interrupted by the activities at the NTS. While workers at the base were still working on the U2, Lockheed began to develop a reconnaissance aircraft that would later become the SR-71 Blackbird. The Mach-3 aircraft was a part of the CIA OXCART project and is what forced the expansion of the Groom Lake facilities that were built to handle the U-2 project. The length of the new aircraft demanded a much longer runway, as well as additional facilities to house and maintain the aircraft. In 1962 the airspace around Lake Groom was closed and a number of new aircraft were shipped in to the area. The first OXCART made its appearance in 1962 and took flight just two months later. In 1977 the Lockheed Have Blue stealth fighter prototype was finalized and took flight. A number of other similar prototypes were also developed for the next four years until the testing of the Have Blue transformed in to the production of the F-117 stealth planes. The F-117 planes themselves weren’t the only element that was tested at the Lake Groom area but the weapons that were used in these stealth fighters were also tested. During this time the Lake Groom base was also used as the training base for the first class of frontline pilots who were assigned to the F-117 stealth fighters. While the Area 51 location served as the home base for everything F-117 at the time, F-117 operations would eventually move first to the Tonopah Test Range Airport and then to the Holloman Air Force Base. In 1983 when the F-117 took flight Groom Lake continued to serve as a testing facility for aircraft technology for the United States. In the following years the base was further expanded including expansion of the runway to allow for programs of larger proportions. Currently the Area 51 air force base now has seven runways for testing of aircraft, although it is believed that the largest of the seven runways is now closed. In 1995 the United States government also expanded the restricted area around the base to ensure that there was no visual access to the base itself. Prior to this expansion activities of the base could be viewed from nearby mountaintops; however, the expansion of the protected area included this zone and ensured full privacy for activities at the military base. The expansion of the protected area created a 3,972 acre area of protected land to which access to the general public was prohibited. Expansion of the protected area around Area 51 is not the only step that has been taken to ensure the security of the air force base. The entire perimeter of the base is patrolled by subcontracted security guards. The security guards are most commonly armed with M16s and patrol the perimeter in a variety of vehicles including SUV’s, Humvees and pickup trucks. Security guards for the Area 51 perimeter have not been noted to use excessive force with any civilians in the area; however, they are fully permitted to do so if a civilian attempts to pass in to the protected area and does not heed warnings against doing so. In fact, should civilians attempt to pass in to the restricted area after ignoring warnings not to do so, patrolling guards are permitted to use deadly force in order to protect the security of the base. Most commonly though, civilians who are interested in seeing what is going on at Area 51 come close to the perimeter at which point they find themselves being followed by a security guard who contacts the Lincoln County Sherriff to take action. The most common punishment for coming too close to Area 51 when not permitted to do so, is a fine which seems to average at around $600; however, those carrying cameras or those who appear to be reporting on the area sometimes receive visits from agents of the FBI following payment of their fine. Cameras are also confiscated on most occasions to prevent sharing of any protected information about the area that could fall in to the wrong hands. Many people believe that they can get away with getting a little closer to the base as long as patrolling officers are not close by, but the base is also surrounded by buried motion detectors which alert security to trespassers who are stepping too close to the perimeter. The actual area cannot be found on most maps, at least not those accessible to the public. Aviation charts do mark the territory of Area 51 as being restricted airspace in order to notify pilots not to fly through the airspace; however, it is not specifically marked as being Area 51. Other maps mark the area as Groom Lake, the Groom Mine or simply “federal land” but none of these maps depict any detail about the base or the existence of specific buildings in the base. A glitch in 2007 did add the Area 51 aircraft base to the aircraft navigational systems Jeppesen database with a unique identifying code. The update referred to the location as “Homey Airport” which is why many now refer to Area 51 as “Homey Airport.” It is believed that the information in regards to the air facilities at Area 51 was released accidentally and the Aircraft Owners and Pilots Association made sure that all pilots were aware that “Homey Airport” should not be considered as an option for landing and that it was located in restricted airspace. The use of the base by the government to develop a means of weather control. The use of the base by the government to develop time travel technology. The use of the base by the government to develop teleportation technology. The storage of and reverse engineering of alien UFO’s. The examination of living and dead extraterrestrials recovered from crashed UFO’s. Collaboration of the U.S. government with extraterrestrial beings. The use of the base to create and support a one world government. Genetic engineering of human – extra-terrestrial hybrids utilizing alien specimens recovered from the area. The creation and expansion of camouflage and chameleon technology that disappears to the human eye. The development of an underground railroad that runs across the continent. Unfortunately for those who truly believe in these conspiracy theories and other ideas as to what Area 51 is being used for, these theories are dismissed by the majority of the population. While a larger proportion of the world will claim that they believe in extra-terrestrial life, a significantly smaller portion give credit to any of the conspiracy theories that have surfaced in regard to the use of Area 51. Commonly those who believe that Area 51 are classified as being abnormal, insane or just strange, yet while there is a significant lack of evidence to support their theories there is also no significant evidence to prove that these things could not be occurring either. 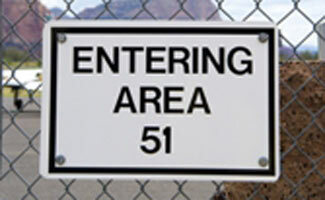 When it comes down to it Area 51 is an area of intrigue because it is an area that we are prohibited to enter or even approach. Like a child who is forbidden to enter a particular room in the house, there is nothing that most of us would rather do than go in to that room and take a look around. Our curiosity is simply too much to take and we find ourselves coming up with fantastical ideas and theories about what could actually be taking place in this “secret room.” Will we ever truly know what goes on behind the fences of Area 51? At some point there is bound to be an individual or group of individuals who release information about the government owned territory and while this may satisfy the curiosity for many of us it may present far more danger than our own curiosity did. We are in considerable less danger at the hands of our own imaginations than we are should the actual events that take place within Area 51 get in to the wrong hands. The restricted airspace is restricted for a reason. The fences around the perimeter are there for a reason. The limited knowledge about the area is limited for a reason. What is that reason? Well, it depends if you ask a conspiracy theorist or a non-believer, but either way for the time being it is perhaps more beneficial for us if we stop asking questions about this secluded area and realize that we are not made aware of events for a reason and it is unlikely that this reason involves extraterrestrial life forms. A few readers here at Exploring Life’s Mysteries have asked for more official information about just what it is that happens at Area 51. The main problem with this request is that there is very limited information available about this mysterious location. The following are some official statements that have been made in regards to the presence and use of Area 51 since its creation. This statement was made in a letter written by President William J. Clinton to the Speaker of the House of Representatives and the President of the Senate. It is important to note that seldom is Area 51 ever referred to directly as Area 51; rather it is referred to as the “location near Groom Lake, Nevada.” Could this be a method of adding more mystery to the location? It is unlikely. Instead it is more likely that the term “Area 51” is used to signify the geographical jurisdiction of the Department of Energy and other institutions refer to the area instead as the location near Groom Lake. There is also a possibility that the term “Area 51” is shrouded with such a stigma that official documents and statements avoid its use all together. This latter explanation is unlikely however, due to the fact that it has been noted that the Central Intelligence Agency uses the term Area 51 in their official documentation as well. Above is an official response from a major of the United States Air Force and chief of the White House inquiry branch, Office of Legislative Liason. This typed response once again points to the fact that the area that is often referred to as “Area 51” is not generally referred to as Area 51. Nor is this area in question partaking in any activity that is able to be divulged to the general public without causing potential risk to the security of the nation. Why is this statement significant? The statement which was released by the Obama administration is the first such statement since 1947. As the first statement to give a formal position on extraterrestrial life from the executive branch in writing, this disclosure was intended to put to rest concerns of conspiracy theorists. Ironically however, it has led to even more speculation and could the government really have expected anything else? Groups of individuals who dedicate their lives to uncovering conspiracy theories and evidence of extraterrestrial life (most significantly in Area 51) are hardly likely to accept a written statement from those they believe are covering up the conspiracy in the first place. In response to the a Freedom of Information Act request submitted by Jeffrey T. Richelson, the Central Intelligence Agency (CIA) released documents that confirm that Area 51 exists and include a map of the base’s exact location. They report that the government used Area 51 as a test site for special surveillance programs. Source: CNN. Why Do We Keep Digging? If the truth is that Area 51 is shrouded in secrecy as a means to protect national security then why do we keep digging? Why seek information that is not intended to be uncovered? For many people it is human nature to be curious. When faced with a closed door and told not to open it, the majority of people when left to their own devices will open it to see what lies behind it. When faced with a closed door and told not to open it because it poses a risk to their life, there is still going to be a percentage of the population who open that door. The question is though; would these people really be satisfied if they found out what was behind that door? If they uncovered exactly what takes place at Area 51 would they be able to take that information at face value or would they continue to believe that it were just another conspiracy theory if it did not jive with their fantastic explanation? Still hungry for more fun facts? This video summarizes the top 10 things you should know about Area 51. I think the government was receiving threats before they started building Area 51 from aliens and I think Area 51 might be an alien proof base for when aliens attack, I’m not trying to sound like a lunatic but it’s hard to explain, if you think about it, it makes sense. Also on devices (e.g iPhones iPads etc.) In auto correct when you type in Area 51 with a lowercase a then it corrects it to a capital a, isn’t that a bit off? I mean it’s not a place or home that is as popular as Jennifer Lopez’s mansion right? I am really obsessed with the idea of working with aliens. Hey listen. ..video on YouTube is about a retired person who was working in area 51 says that actual place with all secret things done is not area 51 it is place called area 52. The guy tried reveal this secret but people working in area 51 told others that the retied guy wasn’t working with us (lied). They destroyed all the proofs about him and also took his degree and told people that see he is not at all have the necessary post to work with us. After some years the friend of retired guy who was also working in area 52 tried to help him to make people believe that he was working in area 52 too and he also showed pictures of them working together and photos of ALIENS too. If you go on Google maps and try to do street view anywhere around Area 51, the little yellow guy that you drag is flying a UFO. Ben, did not know but tried it and it sure does! Very cool, thanks for sharing this fun fact! Can I do this on a tablet or only on my computer? Robert, I tried on my smart phone but no luck, I think it might only work on the desktop version of Google Maps but maybe Ben knows? 1. Lot’s of people have seen UFOs like me and my family, lots have seen the exact same thing in different parts of the world and just so you know these people have never communicated with each other. 2. There are hundreds and maybe more, who have been abducted and had the exact experiences. 3. They also inject some kind of software in your brain which some have had it removed and scientist experimented on it and found only a camera and micro phone. 4. Most of these people get abducted five years or longer after their first abduction and get shown their children…I know this is unbelievable but I have seen it with my own eyes and there’s way more to know. You would get killed if you got too close or if you where further away you would get arrested. Stay away from Area 51. There needs to be more official information released about what happens in Area 51. There doesn’t need to be anything released to anybody? What makes you think that you are owed to know that information? You think just because you are American you should know everything? What have you done to deserve that information? Everyone’s worthy of knowing what it going on in the world unless you are to closed minded to want to know the truth then that’s your own fault. Oh and I’m Canadian by the way. How about the fact that people live around there, they have the right to know wat is happening so close to them. You know, you are a douche bag if you think we should not know what we are meant to know. Humans live in close proximity to each other. We are the same species. One person’s info should be everyone’s info. I’m not trying to interfere, but the way you said that, it’s just…weird. Because it’s as if you are trying to defend them to not give out the info. Don’t take this in the wrong way but, could you be working for Area 51? I think that the government working on top secret whatever at Area 51 should be done in a very secure area. Just look at the things that Russia and China have stolen over the years. But it is really amazing that with the number of people who work or have worked at Area 51 that no one seems to be credited as talking about what actually goes on there.